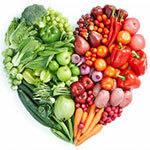 MONDAY, Feb. 24, 2014 (HealthDay News) -- Adopting a vegetarian diet may help people shave points off their blood pressure, a large study from Japan suggests. The research, a review of 39 studies that included almost 22,000 people, found vegetarians had blood pressure that was significantly lower than those who ate meat. On average, reductions seen across the studies were 5 to 7 millimeters of mercury (mm/Hg) for systolic blood pressure (the top number) and 2 to 5 mm/Hg for diastolic blood pressure (the bottom number). While those results are modest, clinical guidelines suggest they could reduce a person's risk of heart attack by 9 percent and the risk stroke by 14 percent if sustained over time, the study authors said. But at least one cardiologist said the study findings are preliminary and he's not ready to tell his patients to abandon meat. The study authors said it didn't seem to matter what kind of vegetarian diet a person followed -- whether it was those that emphasize vegetables, grains, legumes and fruits; those that include dairy products, eggs, and fish; those that just excluded meat, or vegan (which also excludes dairy products). "There were no statistical significant differences between specific vegetarian dietary patterns," said study researcher Yoko Yokoyama, from the department of preventive medicine at the National Cerebral and Cardiovascular Center in Osaka. But, she added, that may be because the studies of vegan diets were small, and may not have had enough statistical power to influence the overall results. The study also wasn't able to tease out which nutrients in vegetarian diets were responsible for the apparent benefit. But the researchers have some theories. They point to previous studies demonstrating that diets lower in sodium and higher in potassium and plant proteins -- as vegetarian diets tend to be -- all tend to lower blood pressure. Thirty-two of the studies that made up the review only compared differences between people who ate meat and those who did not. Those kinds of studies just describe relationships: they can't prove diet alone was the reason vegetarians tended to have lower blood than meat eaters. Just seven studies in the review randomly assigned their participants to eat meat or not. Those kinds of studies are considered to be a stronger kind of evidence. Results from those studies were mixed. But overall, they, too, showed a slight and significant benefit, the study authors said. The study findings were published online Feb. 24 in the journal JAMA Internal Medicine. A cardiologist not involved with the study said he'd like to see additional studies before advising his patients to give up meat. "Most of the data in the review comes from observational studies, and there were only 311 patients total evaluated in clinical trials of limited duration," said Dr. Gregg Fonarow, associate chief of the cardiology division at UCLA in Los Angeles. "Further studies are needed," he added.